Breakfast was very good. Really liked the swimming pool and the garden. Towards the end of our stay the pool was getting colder every day. Awesome location. Smiling staff. 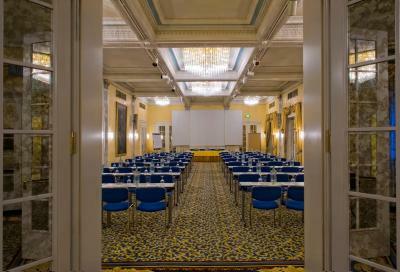 Clean rooms and nice historical building. The breakfast was so good. The view was amazing. The hotel reminded us little bit about the great film of Kubrick; "Shining". You can feel like you have achieved to travel through time to beginning of 1900s. 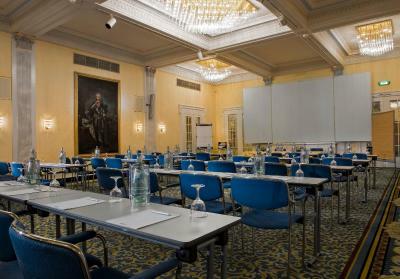 - Prestigious building - large room. - at the checkout receptionist “Kareem” was very helpful by providing us with information around. 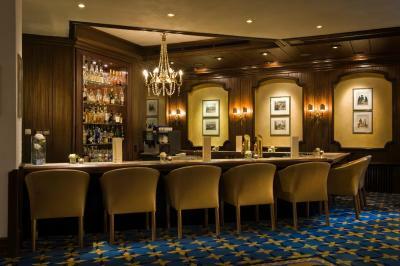 An old grand hotel with a lot of charm. Very friendly staff. Large breakfast room. Very nice pool. 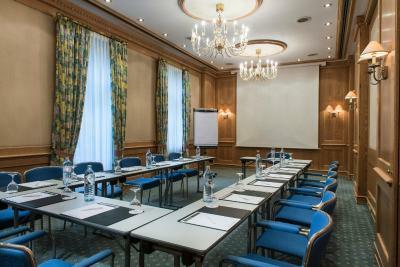 Excellent location; all of Bad Reichenhall is just out the door! It's a historical building. Breakfast was great and the grounds are pretty. 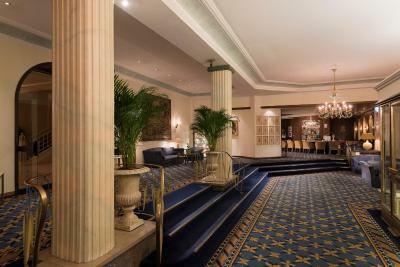 Good breakfast, helpful front desk staff, nice historic hotel, conveniently located in the pedestrian zone. The indoor swimming pool was very pleasant. Big room with extra walk-in wardrobe was excellent. Lovely breakfast and very friendly staff. Superb location. 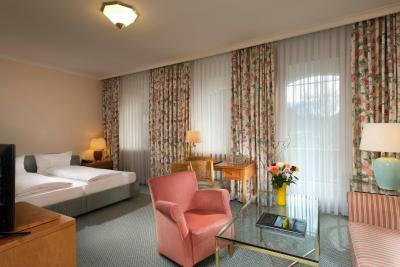 If you can, book a park view room and prepare for a wonderful experience. Wyndham Grand Bad Reichenhall Axelmannstein This rating is a reflection of how the property compares to the industry standard when it comes to price, facilities and services available. It's based on a self-evaluation by the property. Use this rating to help choose your stay! 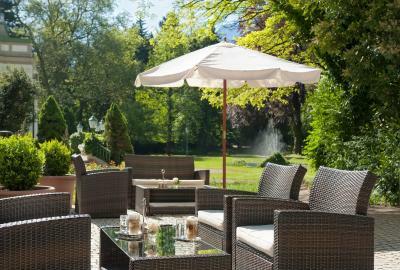 One of our top picks in Bad Reichenhall.Boasting a 98 ft² park and lake, this 4-star hotel in Bad Reichenhall offers first-class cuisine. 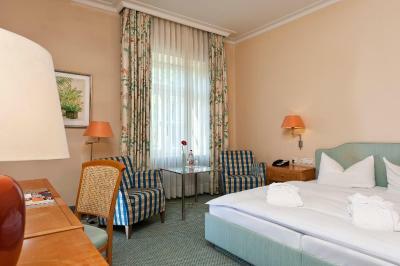 All rooms at Wyndham Grand Bad Reichenhall Axelmannstein are spacious and elegantly furnished. 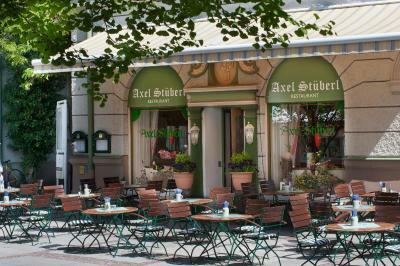 The Axelmannstein is set in the heart of Bad Reichenhall's pedestrian area. 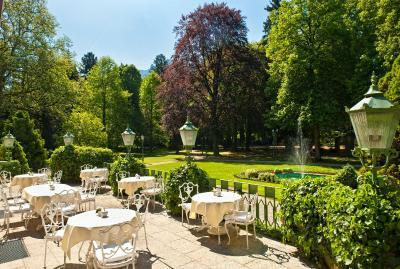 It is opposite the Kurpark (spa park) at the foot of the Predigtstuhl Mountain. 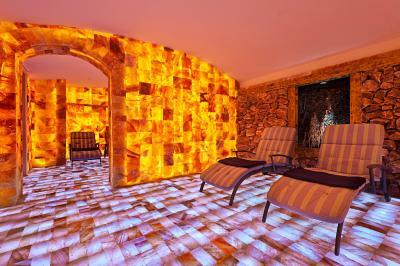 The spa at the Wyndham Grand Bad Reichenhall Axelmannstein features a modern swimming pool, sauna, solarium and gym. Other sports facilities in the area include a golf course and a tennis court. 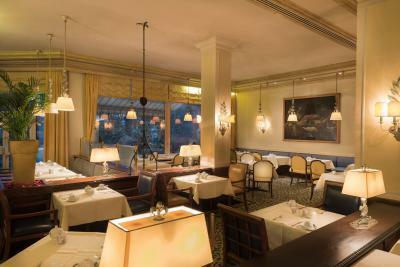 A breakfast is served in the breakfast room each morning. 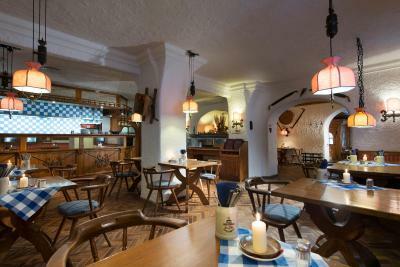 There is also a café and bar as well as a traditional Bavarian restaurant, Axelstüberl. 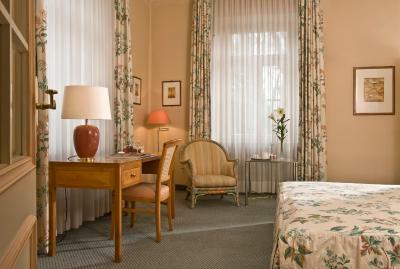 This is our guests' favorite part of Bad Reichenhall, according to independent reviews. 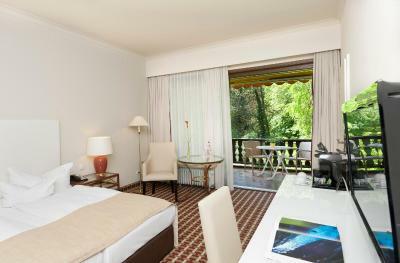 When would you like to stay at Wyndham Grand Bad Reichenhall Axelmannstein? 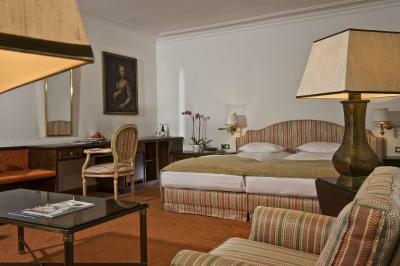 Elegant room with satellite TV and a private bathroom. 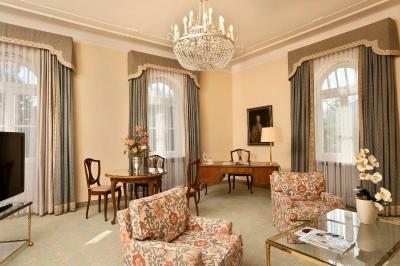 These rooms are very spacious and overlook the garden. 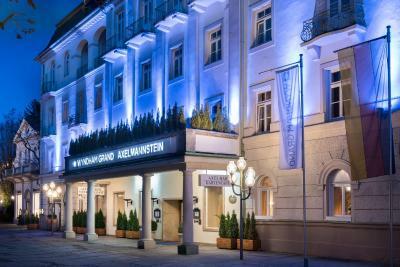 Embedded in the Berchtesgarden Alps the Wyndham Grand Bad Reichenhall Axelmannstein is located in the heart of the pedestrian zone, in the beautiful old town of Bad Reichenhall. 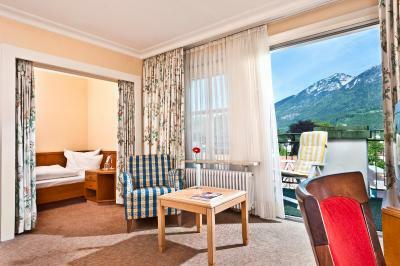 Sleeping at the Wyndham Grand Bad Reichenhall Axelmannstein means staying in an historical hotel with a fantastic view towards the mountains. This hotel is just the perfect place to come down. 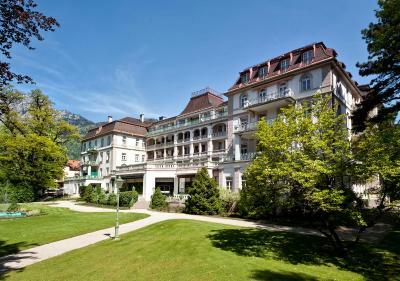 House Rules Wyndham Grand Bad Reichenhall Axelmannstein takes special requests – add in the next step! 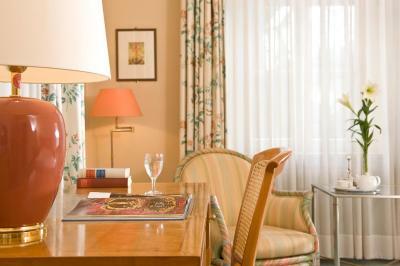 Wyndham Grand Bad Reichenhall Axelmannstein accepts these cards and reserves the right to temporarily hold an amount prior to arrival. Google Maps or Apple Maps could not find the main entrance of the hotel. It was not marked properly. Parking lot was in awkward location and I had to walk a while with my luggage to find the hotel entrance. The whole building is rather old. On every corner you see that it was purely renovated. The area in front of the hotel is also under reconstructions and building doesn`t look so nice as on photos. Only one elevators works and sometimes you need to wait to it although it is only 4 floors building. Internet and TV didn`t work in our room (351). After I informed personnel about it, they told that it is because of the Iphone cover (totally nonsence). Nobody tried to repair it (restart router) after my notice. 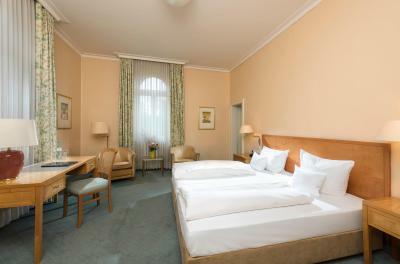 Hotel is situated in the center of small city. The area around the hotel is pictureous. Great view from the swimming pool into the park. Spacious place for breakfast with good food. Restaurant near the hotel is great. Really enjoyed the food there. Requested hypoallergenic bedding because of asthma. Feather bedding supplied and it took quite of attempts to get the bedding changed. 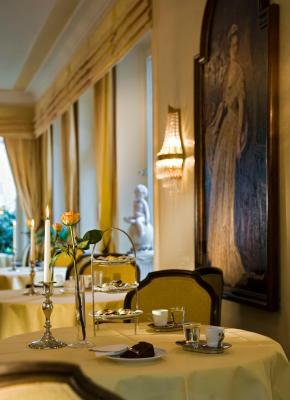 Good breakfast in lovely dining room. Pleasant, helpful staff. Had half board. Waiter very helpful source g gluten free options. Every morning cca at 9.00 cleaning team is knocking at the door disturbing you. Perfect location. Very good pool and sauna. The sauna and the pool was fantastic. The room was nice and clean, and comfortable size. The restaurant next to the lobby had nice meal for reasonable price. 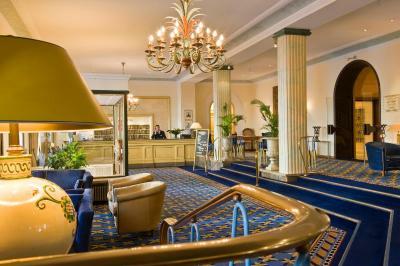 The athosmphere of the lobby, staircase and breakfast area ia quite amazing, you can feel art nouvo style there. In parts needed some decorating to bring it up to a good standard expected from a 4 star. I'm being critical as is a very nice Hotel. Good size rooms. Very good breakfast. Friendly staff. Only 1 lift working. Sauna very small (three persons lying down, or six sitting, max.). Clocks everywhere, but most not working (quite confusing). Restaurant refused service at noon on Dec. 31st (without any advance warning). Room service knocks on doors at 8 am, opens doors, apologizing if someone's inside (saw this over a whole corridor of woken up guests). Room smelled distinctly like smoke from people smoking on the balconies. Shower curtain 30 cm to long, so you trip over it. Tiles in bathroom painted over, paint peeling. We stayed three nights, rooms were not cleaned during this time, only beds were made (and not very good, more like I would do it at home). Towels on hanger ("to be used again") were replaced one day, Spa-towels on the floor ("to be replaced") were not replaced another day. Just plain weird. The so called "Fitness center" is a mat, a stationary bicycle, a crosstrainer and a treadmill. Internet need re-login every 5 minutes or so (which I have experienced with their provider, myCloud, elsewhere, too). Overall, not a 4-star-experience at all. More like a 2.5 star Best Western. Friendly receptionists. Good location. Good breakfast. Good beds. Bathrobes. The air outside. Really. Amazing mountain air! Heater worked very well (appreciated, as we stayed there in winter). Terrible dinner, terribly old hotel and a complete desaster for that kind of money! Also the wellness area is not appropriate anymore and seems to be from ancient history. Rooms are clean but run down. The whole hotel is run down but clean. Breakfast is delicious. The room where you have breakfast is great,very different from the rest of the hotel. We had half board and it was worthwhile. Staff are helpful, car park is close and easy to reach. In spite of the general appearance we would go back. 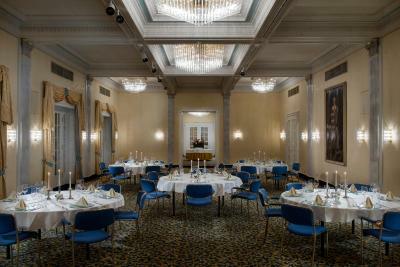 Buffet dinner is not worth the money The property needs some remodeling and construction The parking is not easy to find since it's marked with the old brand of the hotel "Axelmannstein"
What we found was a very old with poor service and quality Hotel. We were given a large room next to a service elevator we could hear all the time in the room. We asked the room service and reception for a water boiler that was never brought. We lost some work written in the Computer die the innestable and Bad Internet conexion. Breakfast room is beautiful however the sortiment is too basic and not high Quality. 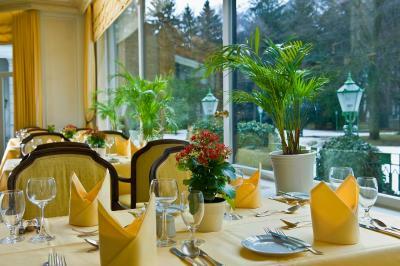 We made use also of the Traditionslinie Restaurant and was very dissaponting the kitchen. The Check out took 20 minutes because the Computer was too old and the recepcionist had to type several times the words. Price is not right or balance with the quality and service given. 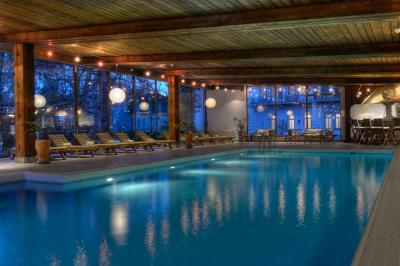 I Booked it because it included breakfast had a Swimmingpool, rooms were large and was supposed to be near Königsee. The hotel is old and we were initially given a very old room that had chipped paint and mould on the walls in the extremely old bathroom. These first rooms were drab and dated. We were given these rooms as they were interconnecting, so to be fair the hotel was trying to accommodate our wishes. 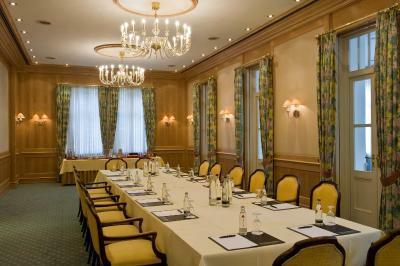 However the standard of the rooms was lacking and completely unacceptable at the price. We advised the staff who arranged for us (whole family)to have a room change without issue (but no longer interconnected). The new rooms whilst old (bathrooms were renovated) at least carried the charm that we had hoped and expected to find in such a lovely old (150 years) hotel. Breakfast was great. The staff were very friendly and helpful. It was in a convenient and pleasant location. 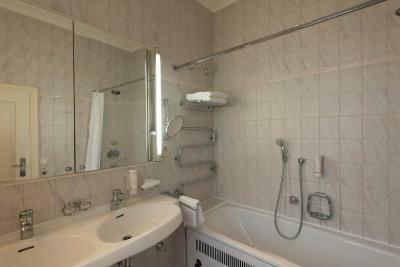 Only steps from the local shops and situated on a beautiful park with views of the mountains. It had beautiful antique furniture a quaint and cosy bar, a fantastic sauna and pool and whispers of former hotel glory days. Overall, it was exceptionally charming and enjoyable.